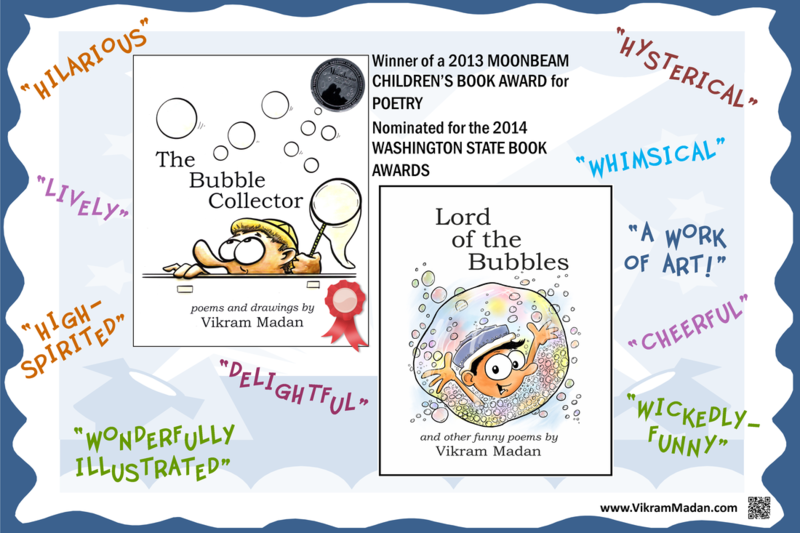 Learn more about Vikram's popular poetry books THE BUBBLE COLLECTOR and LORD OF THE BUBBLES. "This visual connection to literacy is so important to kids this age. ​The Bubble Collector is a great example of this." 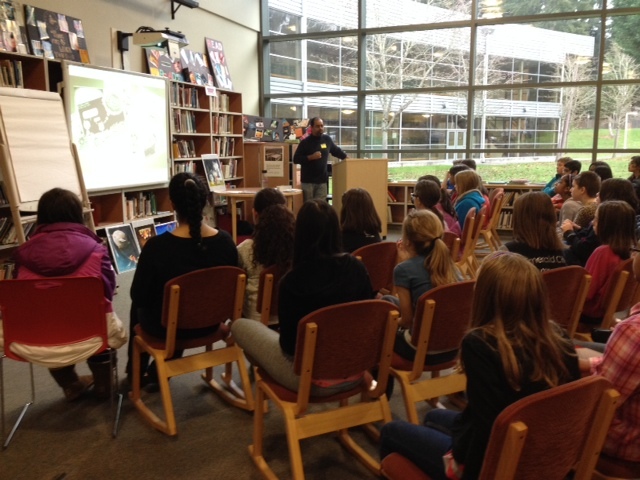 ​Vikram does both in-person and Skype author-visits for schools. 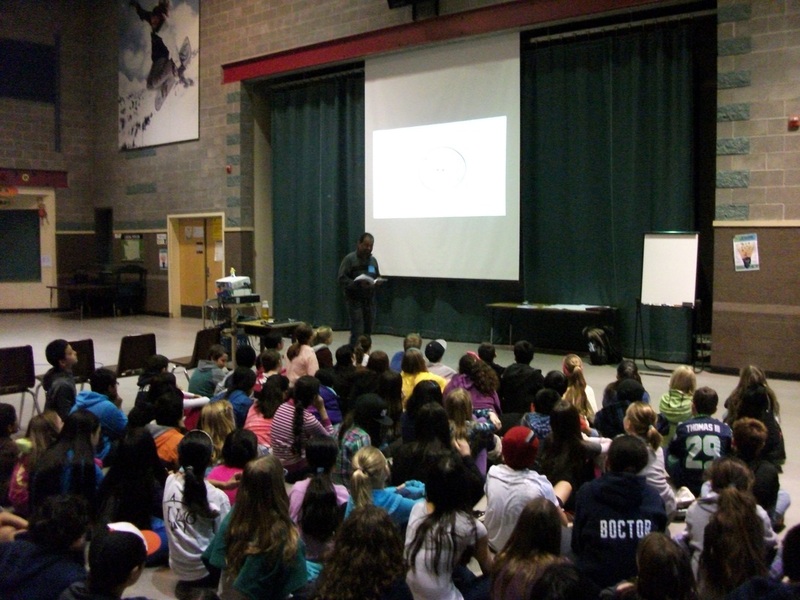 Visits include assemblies for grades K-3 and assembly-workshops for grades 4-6. 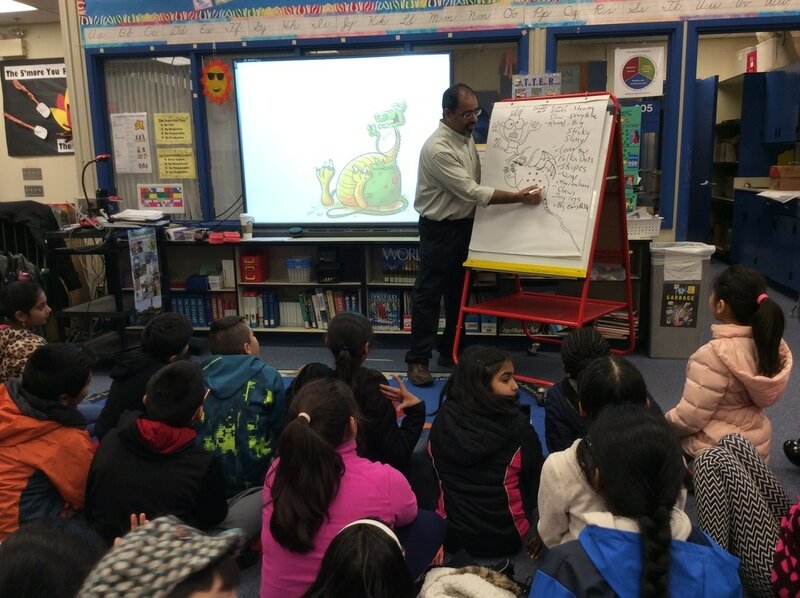 As an Poet, Illustrator and Humorist, Vikram can engage kids with a unique combination of words, images and humor, giving them insight into both the drawing and the writing process. Humor is a great way to inculcate an interest in poetry. As an immigrant who grew up in a different culture, Vikram adds to the diversity of voices in the Kid-Lit field. (Teachers and Librarians particularly appreciate being able to introduce school kids to diverse authors to expand kids' horizons for role models and personal potential). "Vikram's presentation was humorous and inspiring for students. He encouraged students through his own stories, poetry and art to persevere as they pursue their unique dreams and aspirations. This important message cannot be repeated enough and Vikram did so eloquently and with grace." 'pulling back the curtain' to show how works evolve (and sometimes have to be intentionally crafted or beaten into shape). Workshops also involve a creative group exercise involving words and drawings, including writing a quick little poem to show poems are fun and easy to get started with. This exercise usually leaves kids motivated and excited to apply themselves to their own creative projects. "Vikram’s program and presentations were both interesting and entertaining. 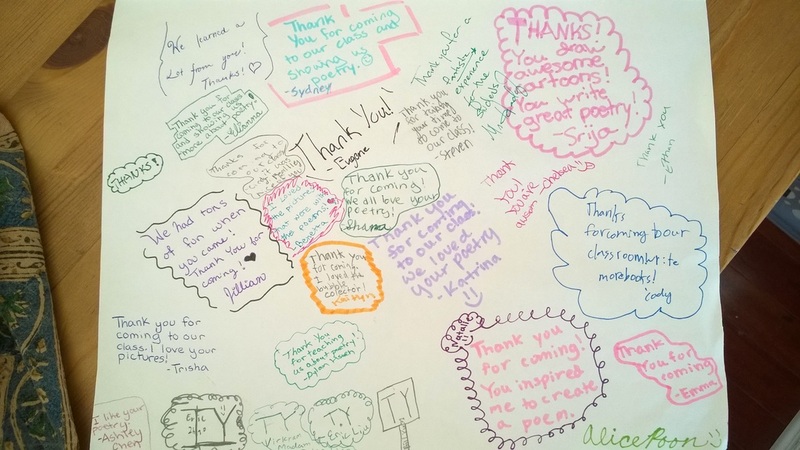 The students learned how to turn ordinary poetry, into compelling works. Vikram was very personable and patient with all students, K-6. I would highly recommend Vikram Madan for any elementary audience." Assemblies for younger grades are usually shorter and involve faster-paced poetry-reading from The Bubble Collector (and other forthcoming books), supplemented with animated visuals to hold the attention of the kids, followed by 'Ask the Author' Q&A as well as drawing demonstrations and exercises. With a smaller audience of younger grades (20-25 kids or less), Vikram can conduct a longer assembly that additionally includes creative group-drawing exercises that invite the kids to use their imagination and excites them about the possibilities of creative visualization. Vikram has done K-3 assemblies for upto 250 kids at a time. "We had the honor of hosting Vikram Madan in our class. After his presentation, each student dropped everything and started writing! The kids in my class adore [The Bubble Collector], and I love it because it’s very clever and fun to read." Note: The content and nature of each session will vary based on the size and age of the groups you will want Vikram to meet with. In general, the more intimate the setting, and the smaller the group, the more the kids will get out of the visit. For schools more than 50 miles from Bellevue WA: There may be an additional fee to cover travel time and distance. Please contact Vikram for a quote. "In addition to engaging students in the fun, fantasy and whimsy of his poetry, Mr. Madan also communicated the invaluable lesson of perseverance in the writing process." "Seeing your artwork has opened up a world of possibilities for my students. They are now really excited about art. As a special benefit, Vikram can provide students with copies of his award-winning poetry books, The Bubble Collector, and Lord of the Bubbles, at a special discounted school price. 1. Projection system - for showing a PowerPoint presentation. 2. Large drawing surface - Flip-chart (preferred), smart-board, white-board etc. 3. Wireless Microphone for large spaces like gyms and lunch-rooms, or for large groups. 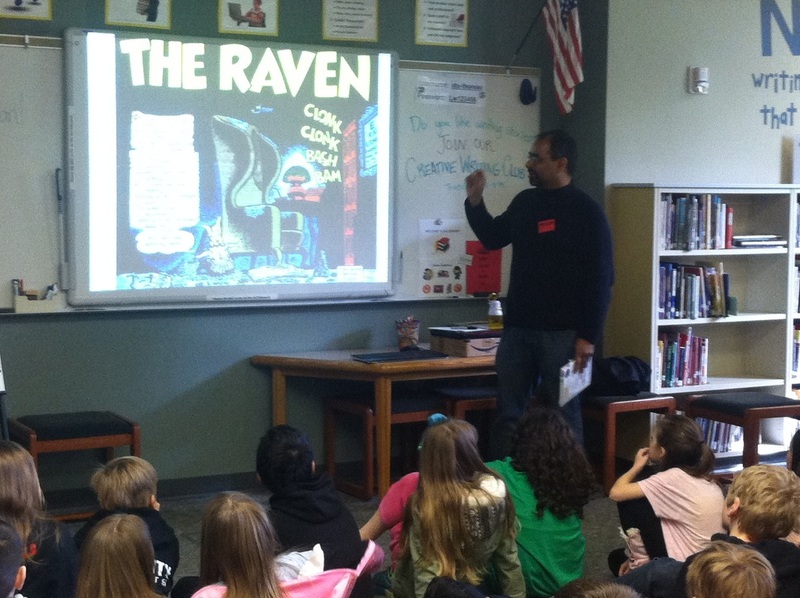 "Vikram's poetry and illustrations are engaging, and my students thoroughly enjoyed the presentation. They stayed through recess to talk with him and had to be persuaded to return to their classes when the bell rang! We had the best time. "Vikram's presentation via Skype was excellent! Our 300 students in grades one through five sat enraptured during his time with us and were inspired to ask him lots of questions. He focused on his experiences as a poet for our "Poem in Your Pocket Day" assembly and was both funny and completely on target. I had at least a dozen of our teachers tell me how wonderfully perfect they found his presentation to be." 1. Arrange a venue - this can be a meeting room in your local public library or community center. You should be able to book the room for no charge. The ideal venue will have a projector and whiteboard (but if these are not available, we can work around that!). 2. Coordinate with the other parents to decide a day and time, and to collect contributions to pay for the visit (See rates above - the more families you can pull together, the smaller the per-child cost). 3. Contact Vikram to finalize the visit. 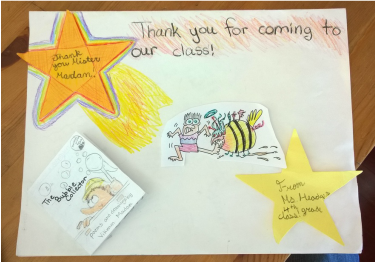 "I liked your book before, but now I like it even more"
"We learned a lot from you"
"Thank you for coming to our class and showing us poetry"
"You draw awesome cartoons! You write great poetry!" "Thank you for coming. You inspired me to create a poem." "We had tons of fun when you came! Thank you for coming!" "I loved the pictures that were with the poems." "I loved The Bubble Collector"
"Thank you for teaching us about poetry"